Peak Lenin in the Central Asian republic of Kyrgyzstan has been on my radar for many years. It’s one of those mountains like Aconcagua in Argentina (“the highest mountain you can just walk up”) that is known for being very big, but technically straightforward. But technically straightforward isn’t the same as easy. The Tour de France is technically straightforward: you just have to keep pedalling (on downhill sections you don’t even have to do that – you can take your feet off the pedals and go weeeeeeee). 7134m Peak Lenin has one of the longest summit days of any mountain I’ve climbed at such a high altitude. From high camp to the summit is 5km horizontally and 1200m vertically, all above 6000m in altitude. It’s also necessary to start the day by descending 100m, which of course means you have to go back up again at the end of the day. Nor does technically straightforward mean the mountain isn’t dangerous. In an earlier post I described how Peak Lenin had experienced two of the biggest disasters in mountaineering history. The vast snow slope between 4400m and 5400m on its standard route is riddled with hidden crevasses and loaded with avalanche danger. Frequently we found ourselves climbing through recent avalanche debris, and rarely have I climbed a mountain which has seen so many huge avalanches fall across the route while people have been climbing it. 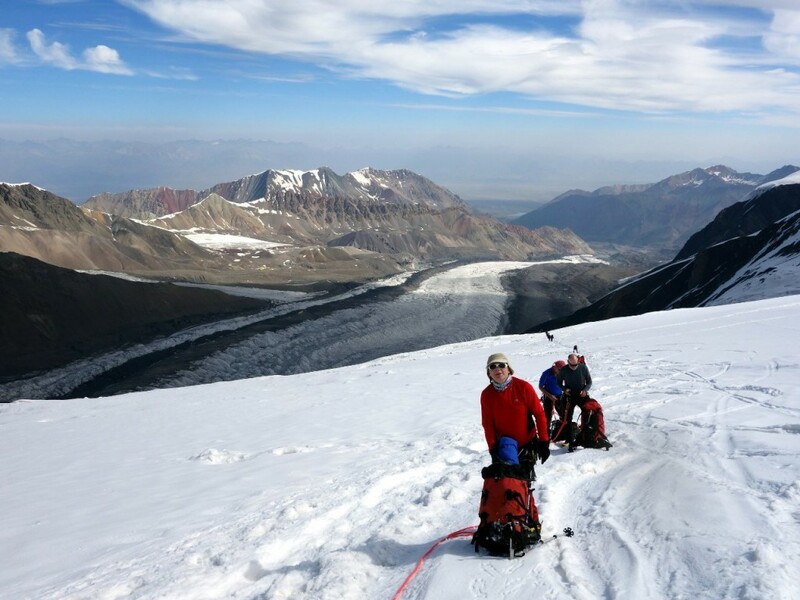 My chance to climb Peak Lenin came when a change in government advice about visiting Kyrgyzstan led to the UK mountaineering operator Jagged Globe organising an expedition with the help of local Kirghiz operator Tien Shan Travel. The expedition was led by Robert Anderson, whom I climbed Cho Oyu with in 2010, and is best known for leading a successful expedition to climb Everest by the Kangshung Face in 1988. 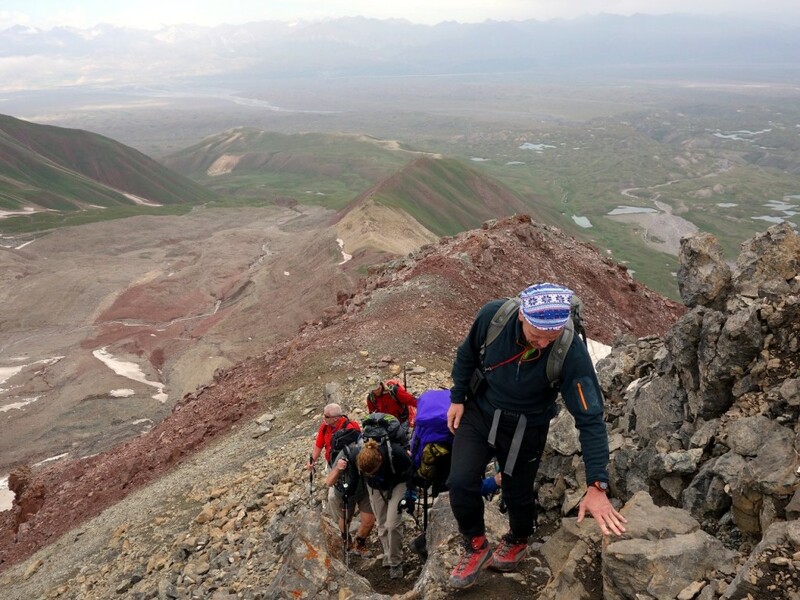 We assembled in the southern Kirghiz city of Osh at the start of the expedition. A 3000-year-old city at a strategic location along the ancient Silk Road oozed with tourist potential but ended up being something of a disappointment. There is almost nothing of its history left, and no historic buildings as far as we could see, apart from an unusual rocky mountain jutting up from the city centre which was home to a shrine erected by Babur, founder of the Mughal Empire, who came from nearby. This particular attraction was noted for having some of the slipperiest, shiniest rocks in existence, polished to a texture of glass by centuries of erosion (and Kirghiz slippers). How I managed to stay on my feet was a miracle, though my efforts to remain standing probably led some of the local women to believe I was Michael Flatley performing Riverdance. Peak Lenin lies in the far south of Kyrgyzstan, on the border with Tajikistan. It’s a six-hour drive to base camp, four on paved road, and the last two along a dirt track across a grassy plain. We could see there were high mountains in the clouds ahead of us, but none were visible. Despite camping directly beneath it, it would be days before we had our first views of Peak Lenin, and at one point we wondered if we ever would. Achik Tash Base Camp (3600m) lies in a very pleasant setting among folds of grassy meadow dappled with lakes. We had a comfortable setup, sharing large four-man tents between two of us. 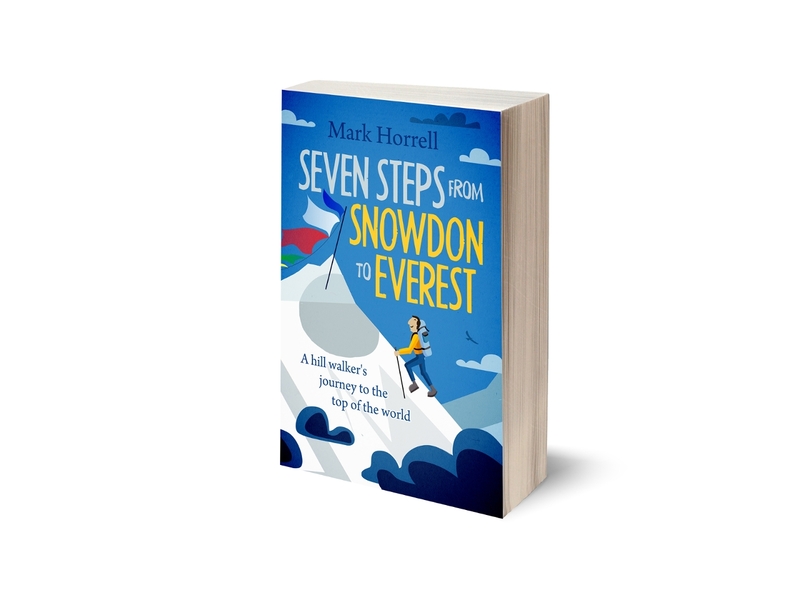 I shared with Ron Rutland, who had many extreme adventures in the Himalayas and Karakoram in the 1970s, before settling down to run an outdoor business in Cumbria. He had also been on our Cho Oyu expedition in 2010, and is a fountain of useful information and interesting stories. We had a fully-catered camp which included a kitchen yurt, dining yurt and full kitchen crew. The food each evening was excellent. We also had the help of three strong Russian guides, Andrei, Max and Victor, who would be joining us on the climb. We spent three days at Achik Tash acclimatising. On the first day we walked up to Traveller’s Pass on the trail to Peak Lenin, across a wide meadow known as the Onion Glade (there were quite a few wild onions growing there, though you had to look hard to find them). At the end of the Onion Glade the trail continued up a narrow, grassy valley teeming with marmot burrows. As the trail approached the pass the grass petered out into rock, and beneath the pass it became a steep band of scree, zigzagging upwards. We completed the walk in a thick damp mist, on muddy trails that wouldn’t have been out-of-place in a pig farm, and could see nothing from the pass. The plan for the following day was to climb a small summit overlooking base camp called Peak Petrovsky, but on learning it was 4800m high, and would involve 1200m of ascent, ice axe, crampons, rope and mountaineering boots, a few of the more seasoned team members, including myself, indicated a preference for an easy stroll instead. We decided to amble up to the snow line with the rest of the team and then go back. It ended up being something more than an easy stroll, a very enjoyable ridge walk overlooking camp, with a bit of easy scrambling towards the top. We didn’t reach the snowline until 4400m, by which time we were well satisfied with our acclimatisation walk, and took a shortcut back to camp via an exhilarating scree gully. We descended 300m in ten minutes and were back at camp in time for lunch. 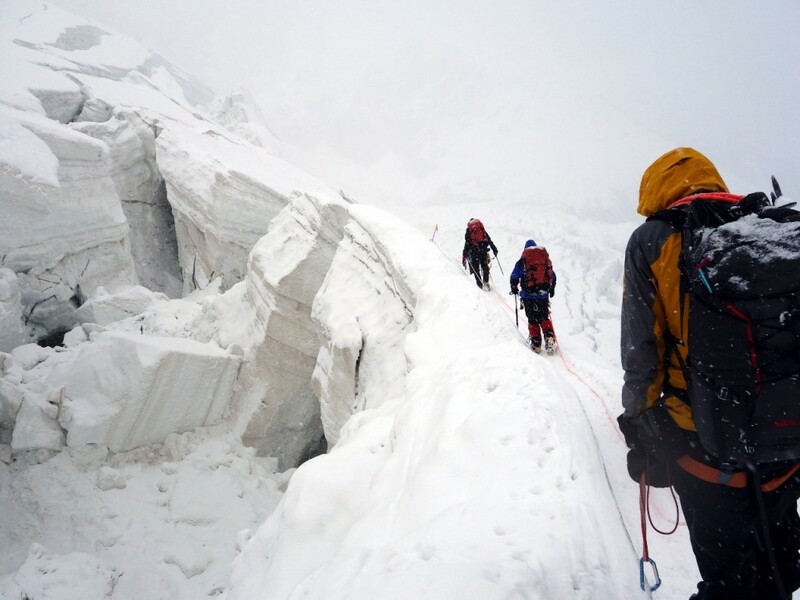 We expected the rest of the team to be out all day, but they returned only an hour after us, having ascended little more than a single rope length more than us before deciding the snow and rock conditions were too difficult. The following day we left base camp to move up to Camp 1 (4400m), which was more of an advanced base camp, and our base for the rest of the expedition. It had similar facilities to base camp, with large sleeping, kitchen and dining tents, and excellent food provided by an on-site catering team. It even had a hot shower available at the princely price of 10 euros. But it was in a much bleaker location than base camp, on the edge of a glacier, and surrounded by forbidding ridges of black moraine and dirty grey ice. It was half day trek to reach the camp. Beyond Traveller’s Pass the trail descended into a parallel valley, before continuing up it along a narrow trail which clung to the sides of steep moraine banks. We received news of an avalanche that morning on the trail between Camps 1 and 2, which had caught two climbers, although they escaped uninjured. Peak Lenin was still in cloud, but we could see the bottom section of its vast north face, across which the route to Camp 2 traversed. There was obvious evidence of a huge avalanche on its left fringes. We could also see the trail, which clipped the edge of the avalanche zone before curving off to the right. It rained continually throughout our first few days at Camp 1. Our tents leaked relentlessly along the edges and at the head, and anything we left on the floor or touching the sides would be wet by morning. We clogged up the ends with towels and dry bags to avoid waking up in a pool of water. There was very little time during the day to dry anything outside before the rain started pattering down again. There was still no sign of Peak Lenin, but we observed several avalanche trails on its lower slopes. Ron explained that these were wet snow avalanches, caused by a build up of heavy slush separated from the harder ice underneath by a channel of running water. It needed cold air to freeze the slush, but it was surprisingly warm. Rarely have I longed for snow, but rain was all we had. We completed a couple of acclimatisation hikes up the bleak moraine ridges surrounding camp, and did some fixed-rope practice on a nearby snow slope. Finally, more than a week after leaving Osh, we had a couple of days of fine weather, and our first views of Peak Lenin. It was not a particularly interesting mountain from Camp 1. The only thing impressive about it was its size, rising 2700m above us in a wall of snow. Both of its main ridges slanted very gently from the summit, giving it the appearance of a solid wall rather than a pointy mountain. There was very little rock to provide any variety. I was glad to have photos of it at last, but I felt like I was simply photographing a giant white stripe. We also had a better look at the route up to Camp 2 by watching figures on the wall. After ascending a glacier the route climbed steeply for a while before traversing to the right towards a rock triangle. Just before the triangle it passed across a flat basin above a tumbling icefall. Above the basin were a number of seracs and some avalanche debris, which Andrei, the leader of our Russian guides who had been up there earlier in the day, said didn’t quite reach the trail. The basin had to be the area known as the Frying Pan. In 1990 forty-five people were camped there when an earthquake caused the seracs to collapse above camp. There were only 2 survivors and hardly any of the bodies were ever found. Camp 2 had been moved a little higher up the slopes since then. 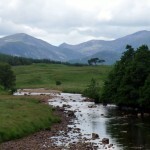 We left for our first foray up the mountain on Monday 27 July in slightly unusually circumstances. We were due to leave at 4am, to do as much climbing as we could while the avalanche slopes were still cold. But 4am was also the departure time of the Lenin Race, literally a running race from Camp 1 all the way to the summit. The race organisers, and the start line, were right next to our camp. On the dot of 4am a bell rang, there were cheers, and then head torches legging it across the Lenin Glacier. And sure enough, they were running – in heavy mountaineering boots. One of our guides, Max, had taken the day off from guiding to take part himself. 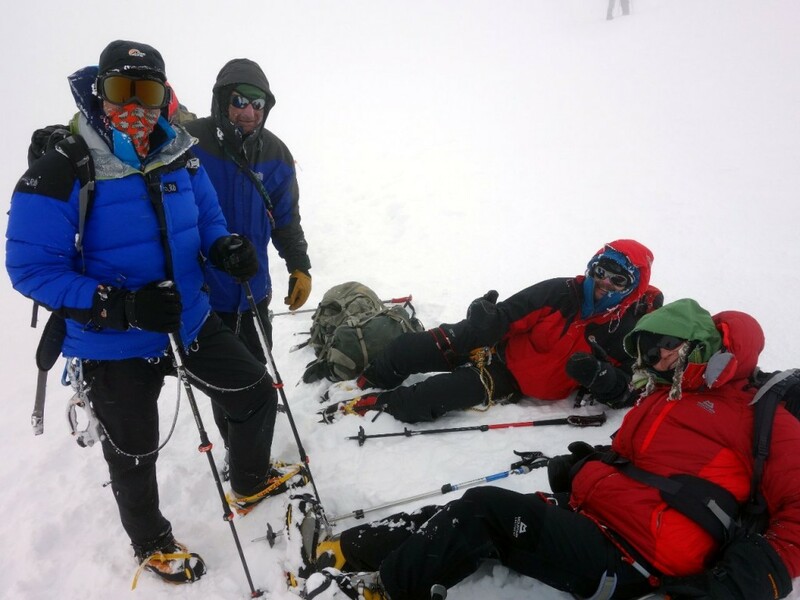 He ended up coming 3rd, reaching the 7134m summit in 7 hours 45 minutes. 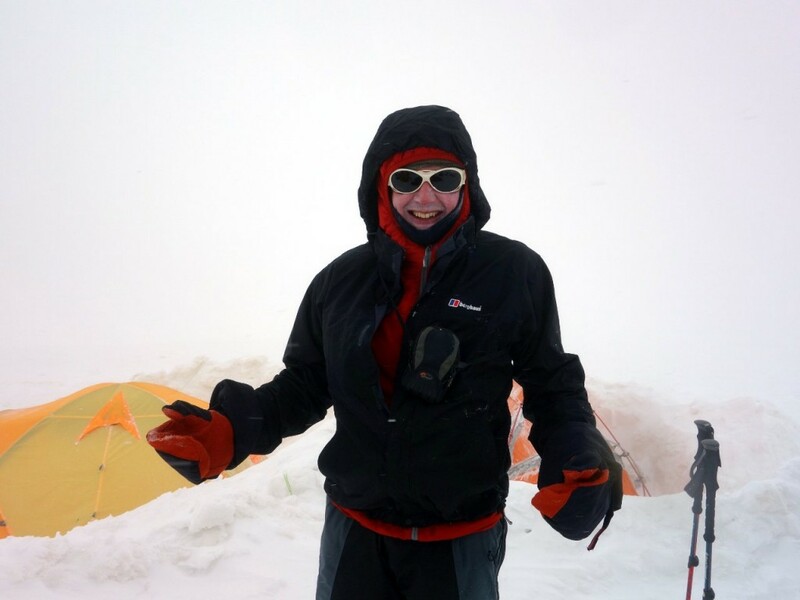 The winner took 6 hours 44, and they both reached the summit before we even made it to Camp 2 at 5400m. Hats off, but what a crazy thing to do, especially with all those crevasses. It took us about an hour to cross the Lenin Glacier to the start of the climb. We crunched across hard ice, dusted with fine gravel. There was no need for crampons, apart from a 5m drop which we slid down on our backsides, a poor manoeuvre for the trouser fabric, and I ended up splitting mine. It was busy at the start of the headwall, with many climbers choosing this rare fine morning to make forays up the mountain. We put on our crampons and followed along behind them. Dawn was breaking as we set off up the headwall. The climbing was easy. We started up very hard ice, weaving between a great many crevasses, then climbed a steeper section of zigzags on fixed ropes. Above this was the part of the route struck by a wet-snow avalanche on the day we advanced to Camp 1. The area was a tumble of giant blocks of ice the size of cars. For the next few hours we traversed diagonally to the right up a gentle snow slope. The sun was in and out of cloud. When the clouds come over it was cold, but when the sun hit the slopes the heat was blistering. At about 11 o’clock we crested a rise and looked across a big snow basin, the Frying Pan we studied from below the previous day. 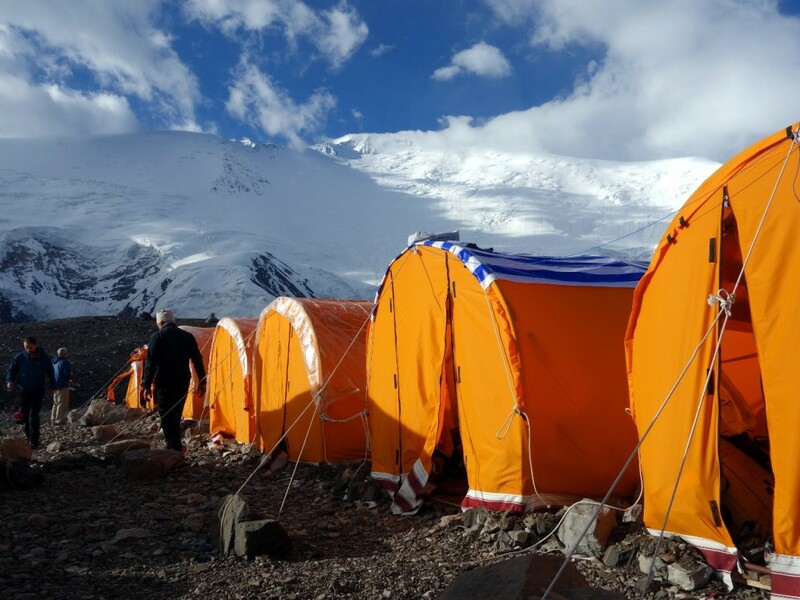 The colourful tents of Camp 2 were pitched on the far side, a little up the slopes beyond, to provide safety from the huge seracs which menaced the whole basin. We reached camp at midday. It was busy, and there was no single place to accommodate all of our tents, so we spread out among whatever spaces we could find. Ron and I dug a platform for ours, but then discovered we were right next to the toilet pit. We were alarmed to speak to a solo climber who had no qualms about admitting to us that he was using someone else’s tent while they are away. He had not asked permission, and did not seem to feel there was anything wrong with this. We had brought extra equipment up which we would not be needing at base camp, and wondered whether it would be safe to leave there. Andrei later told us to take it back down again, or it would probably be stolen. There were two holes in our groundsheet which we had to seal with duct tape. The groundsheet turned out to be porous, and anything we left in the tent which wasn’t lying on something else ended up saturated with moisture by the morning. The toilet pit turned out to be more of a toilet area. Somebody had built a snow wall to hide your modesty behind, but there was no pit, and it was a case of finding a patch of ground that hadn’t already been used. I spotted several small crevasses where people had dumped rubbish and unused food to save themselves having to carry it down again. It wasn’t a very pleasant or comfortable camp. 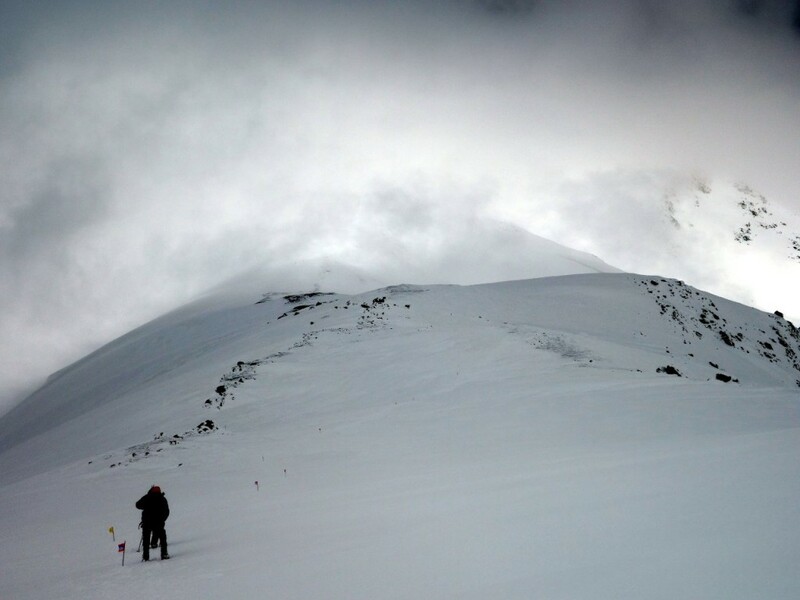 The following day we went up to tag Camp 3, at 6100m. We climbed steeply for 200m out of Camp 2 before joining the long curling ridge that eventually led all the way to the top. We could even see the summit over our left shoulders, though on that dull grey day it didn’t look very impressive. The ridge was gentle and there appeared to be no difficult climbing, but the summit was still a long way above us and the distance seemed immense. We turned left and walked along a broad snow ridge in howling wind with little by way of view on either side. All around us was white. We stopped for a snack on a kind of saddle, where the ridge dropped slightly and flattened out before rising more steeply up to Camp 3. The altitude was 5800m and we had made good time. On the col somebody had built a bizarre life-size ice sculpture of an anatomically-exaggerated woman. It was never explained to us who built it or why, but it was a popular stopping-off point for photographs. The statue melted as the expedition wore on, though this seemed to have the effect of making some of its features even more striking, at least until its head vanished. 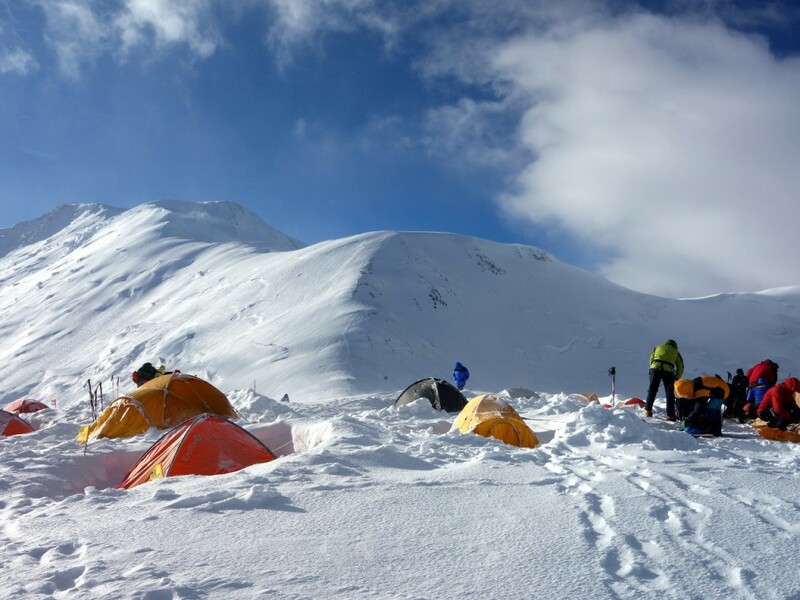 We reached Camp 3 at 1.30 after plodding slowly for 300m up a steep and monotonous snow slope. It ended abruptly at Camp 3 on a small flat-topped subpeak on the ridge. As soon as we crested the rise we were lashed by the wind. We were reasonably sheltered as we climbed the slope, but Camp 3 was feeling the full force. There were no views and it seemed a bleak place on this our first visit, but we were only 1000m below the summit. There was no reason to linger, and at 1.45 we headed back down. The descent was straightforward and we were back in camp at 3.15 after six hours of climbing. The weather had closed in and as we huddled in our tents there was a full-on storm outside. The tent bent in the wind and snow lashed horizontally against the nylon. I would not have been a good night to be up at Camp 3. 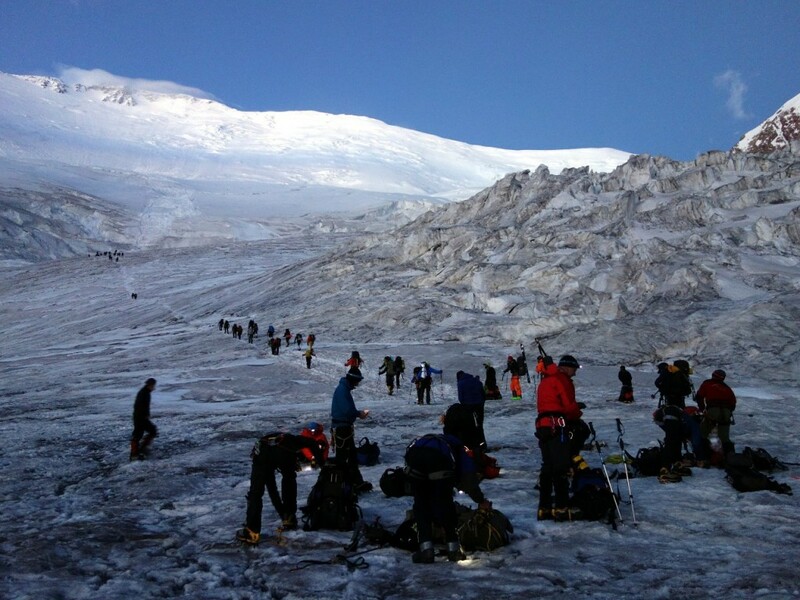 We left Camp 2 at 6.30 the following morning to lessen the risk from crevasses and avalanches. The weather was grim. It wasn’t snowing, but everything hung in a damp grey mist and the trail was partially covered in fresh snow. I led our rope team down, keeping closely to the footsteps of Robert at the back of the rope team we had christened the 57ers (by some odd coincidence all four of them were exactly the same age). The crevasses had opened quite a lot since we came up two days earlier, and there were occasional delays as we queued to leap over them. One or two looked like they would present serious difficulties if they widened any more. We reached the bottom of the wall at 9.30 and had an exhausting one-hour slog across the glacier back to camp. This was the most tiring part of the morning, as the trail undulated over difficult terrain. Back at Camp 1 we had an hour to dry our things before the rain started again. It continued for the rest of the afternoon and conditions were thoroughly miserable. We rested for three days back at Camp 1, and rain fell in buckets. Through the gloom we could see more and more avalanche trails scouring the slopes up to Camp 2. We learned that a huge one had fallen right across the route just a few hours after we descended. It was very lucky nobody was caught in it. The weather forecast wasn’t promising, but Robert identified a possible summit window on 4th August. It was expected to be cold, with moderately high winds, but there were sunny spells predicted that day, rare indeed in that world of gloomy cloud. On the third day, the day before we were due to depart, the cloud lifted a little higher and I climbed up the nearest moraine ridge above camp to survey the scene and contemplate our summit push. 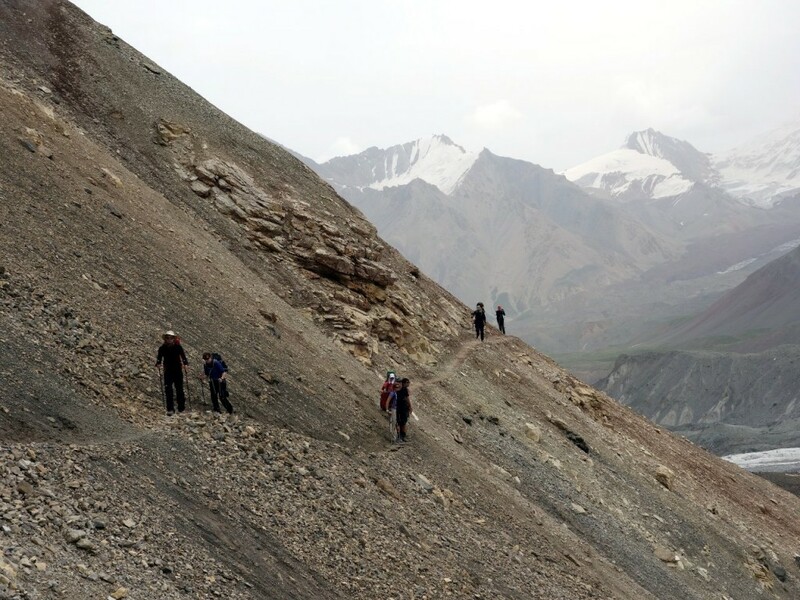 I was able to see the bottom part of the route up Peak Lenin and the acclimatisation hike we did on a ridge a couple of days after we arrived at Camp 1. Ironically everything now seemed much drier. The rain had reduced a lot of the snow. The acclimatisation ridge was laced in thinning black snow where once it had been lily white, and the lower slopes of Lenin were a tortoise-shell pattern of dry ice. There were going to be some big crevasses up there. The rain continued on and off throughout the afternoon, and Ron told me Andrei had said he’d never known the weather on Peak Lenin to be so continuously bad. During a break I headed outside for another look at the mountain. Avalanche tracks were everywhere, and to my untrained eye it looked like a death trap. The rain continued after dinner, and I lay nervously in the tent wondering what the following day would bring, with more snow piling up on those dangerous slopes. At 10 o’clock the rain stopped pounding and I fell asleep. It was a rare dry morning when we left on our summit push six hours later, though no stars were visible. There were many channels of water on the ice before the headwall, which were frozen on our last visit. I kept plodding and tried not to think about the avalanche risk. The ascent to Camp 2 was not without incident. On the headwall conditions had become much drier, and crevasses were starting to open up. Victor and Max had a disagreement about the best way to cross a snow bridge on a steep gradient. There was a fixed rope up it, and Max believed we should attach our jumars and climb, but Victor was all for finding an alternative way around. A little above this we had to cross the giant avalanche track that we could see from Camp 1. Beachball sized chunks of ice overlapped the trail by about 50m and we weaved a way around them. A little beyond this the elite rope team of Ron, Bee and Janet demonstrated their ability for sniffing out crevasses by falling in one. They were all OK, and we had a laugh about it. 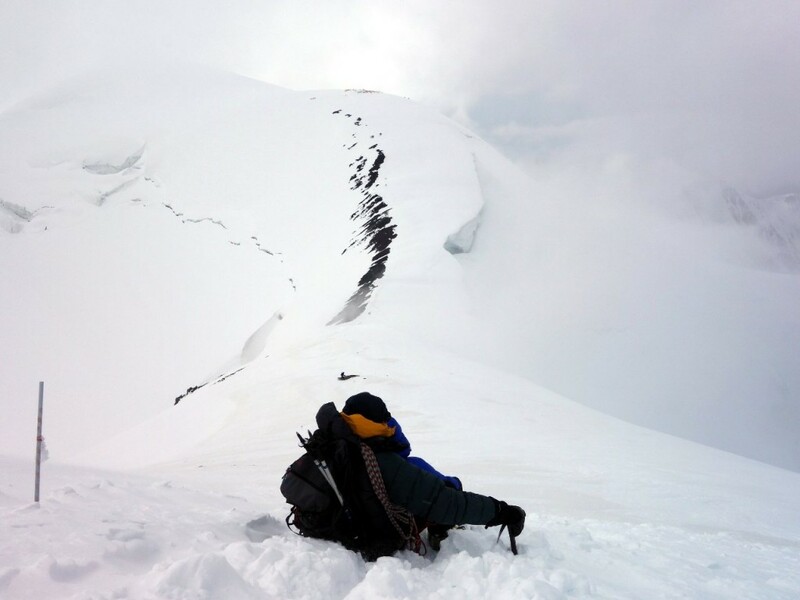 As we approached Camp 2 we could see there had been another huge avalanche into the basin known as the Frying Pan. It stopped short of the trail by the length of an ice axe. Enormous ice sculptures the size of double decker buses had been fashioned from the debris. A gully had channelled the snow away from camp, but not by much. “There would have been brown trousers if you were in camp when that thing came down,” Ron said to me later. The following day we had an uneventful plod up the ridge to Camp 3 behind Ron, who was setting the pace. Camp 3 felt like luxury compared with the ghetto of Camp 2. It sat atop a rounded dome with a flat top. It was much smaller, and there was none of the squalor. Somebody had even taken the time to dig a proper toilet pit that was private and hygienic. Our tents were pitched in a line at the edge of camp, instead of dotted all over in whatever spaces were available. I shared with Mike, who turned out to be a one-man water-producing machine, brewing pan after pan of hot water as we spent the afternoon rehydrating in preparation for summit day. He had nearly as many traveller’s tales as Ron, including an unusual one about the time he was mugged by prostitutes in Quito. Andrei led us off down the hill at 4.30am the following morning, 4 August. We descended a hundred hard-earned metres, some of it quite steep, before climbing back up again. Our group started stringing out early in the climb. I found myself directly behind Andrei, and made the mistake of trying to keep up with him. His pace seemed gentle at first, but the snow was atrocious, deep powder that fell away with every second step, and it soon wore me down. We stopped at the first rocky promontory, and when I looked back I could see that already many of our team’s torch beams were a long way back. I found myself in a small lead group with Andrei, Robert, Mike and Cormac. The other eight members of our team were somewhere on the slopes below us. The terrain eased for a little as we walked through a rock band on firmer zigzags, but then the deep powder snow slopes resumed. It was somewhere on this section that I first started doing what the Americans call bonking (in the UK we call it something else, and tend to do our bonking in different circumstances). The wind was lashing against me and despite wearing down mitts, I had to stop several times to warm my fingers. I dropped behind the others, and by the time I caught them again I was shivering uncontrollably. They were waiting in another area of rocks on the edge of what turned out to be a long plateau. 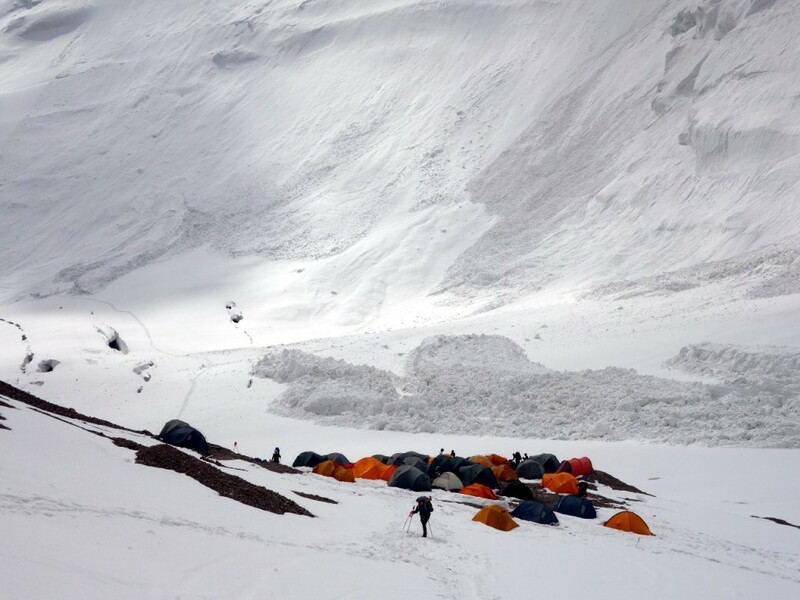 We were at 6400m, in a position that is sometimes used as Camp 4, though there were no tents on this occasion. I was in some discomfort. I had run out of energy, and badly needed food and water, but my fingers were starting to freeze and I dare not remove my down mitts to start fiddling with my pack. It was now light, and perfectly evident that our weather forecast was wrong. It was cold and windy for sure, bitterly so, but where were the sunny skies? We were walking in thick cloud, and could see no further than 50m. Meanwhile I watched in alarm as Cormac, oblivious to the howling gale, squatted down in front of us and relieved his bowels. Never had I been that tired so early into a summit day. It was only our 16th day on the mountain, and it was clear I wasn’t as well-acclimatised as I’d hoped. If I was going to reach the summit then it was going to be a long struggle. Luckily the gap behind us proved to be my salvation. Robert decided to wait for the rest of the team to catch up, and this gave me time to warm my fingers enough to open my pack and eat some chocolate. With the team together again, Andrei led the way across a long plateau. A gap appeared in the cloud, and a giant whaleback of rock appeared on the ridge ahead of us. It appeared to rise for hundreds of metres and was a disheartening sight, but the geography was confusing. The clouds closed again and the land in front of us continued to rise only gently. It wasn’t long before we spread out again. Andrei knew it would be a long summit day, and he was keen to push the pace, but only Mike and Cormac seemed able to keep up. I dropped behind with Ron and kept a steadier pace, and the others were further back still. We regrouped in another bed of rocks just below a steeper part of the ridge known as The Knife. Very briefly the clouds parted to give us a glimpse of figures climbing this feature, a curving snow ridge that fell away vertically on its left side. It was 9.30, and we had been climbing for five hours. My altimeter read 6600m and Andrei confirmed we were halfway to the summit. I collapsed against a rock, and within moments found myself dry-retching into the snow. I had never abandoned an ascent through exhaustion before, but did I have it in me to continue to the summit? I could feel my heart pounding and lungs bursting with every step, the snow conditions were atrocious, and I’d been running on determination alone for some time, but I was not yet ready to give up. I stopped trying to keep up with Andrei, and took a slower pace for the next section. Soft buckets of snow marked the trail up The Knife. Above this the trail seemed to become more intricate, weaving in between bumps on the ridge, and through snow gullies. 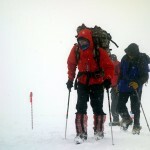 There were a couple of nasty slanting traverses which the snow conditions made exhausting. I caught up with people and dropped behind them again. Then we started crossing an enormous plateau in ankle-deep snow. I could manage only 20 steps at a time before stopping for a few short breaths. Somewhere in the middle of this vast expanse I came upon Andrei, Mike, Cormac, Ron and Bee resting. The others were somewhere behind us, but none of us knew how far back. It was 12.30, and we were at 6900m, just 200m short of the summit (vertically), but Andrei said it would take us another two hours to get there. He said he was going back to look for the others, to see how far behind they were. Two hours of this awful trudging through powder snow, to reach some rocky spot in a complete whiteout, with a bust of Lenin? There was still time, but we needed to get back down again. Was it worth the effort? I was only thinking of myself, but what of the others? I assumed those ahead of me were in better shape, and those behind would turn back if they couldn’t make it, but this was false thinking, and Ron knew better. We greeted these words with relief, and by the time Robert appeared out of the mist we had all made our minds up that this godforsaken plateau would be our high point. Robert had been climbing with three other members of the team, who were only 50m behind us and considerably more exhausted. None of them had thought about turning around, and had it not been for Ron’s quiet question our day could have been very different. It turned out to be the right decision, as we had an epic descent. I was one of the lucky ones, and as soon as we started descending I felt my energy levels return. Those of us in better condition were able to assist Andrei and Robert look after the more exhausted clients. Two of them needed to be helped down on short-ropes. One fell on The Knife, and was lucky to be held on the rope by Andrei before their fall had serious consequences. I climbed back up to assist. For most of the descent I lingered at the back to help if I was needed. The pace was so slow that I spent much of the time sitting down in the snow with a cold wind lashing against me, watching two tiny figures disappear into the mist before catching them up again. It was a surreal experience. It was 7pm before we reached the safety of our tents, less than two hours before darkness fell. 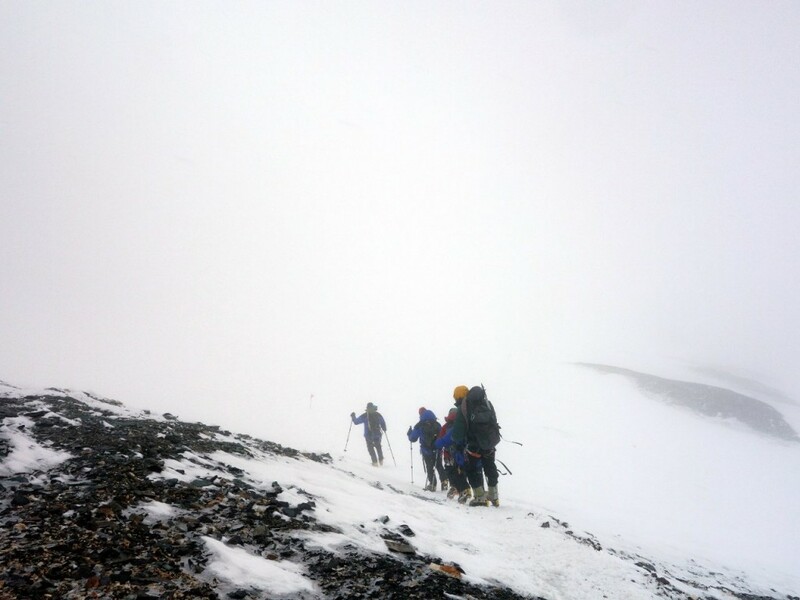 We had been out for 15 hours, but we were all safe, and the 100m climb back up to Camp 3 was a final sting in the tail. We’d not had ideal weather conditions for a summit day. Cold, wind, snow, and poor visibility. Harder even than this were the powder snow conditions which made every step exhausting. The weather had been universally awful throughout our time on the mountain. We had not given ourselves very long to acclimatise, going to nearly 7000m in 16 days. Some of us may have been able to continue to the top, but we were a team, and we cut it fine on the way down. Put all these factors together and I believe it was a bloody good effort to get as high as we did. As Sod’s Law traditionally dictates, the weather improved as we left. The mountain was melting, and there were some huge crevasses opening up in the dangerous headwall between Camps 1 and 2. At the bottom of this section the trail had literally become a stream of meltwater. On the walk out to Achik Tash Base Camp, enterprising Kirghiz horse riders had stationed themselves to carry climbers over a dangerous river crossing, and we were charged $5 a ride. It was money well spent. A curious incident followed at Traveller’s Pass, when a group of elderly Russians clad in combat fatigues sat down in front of us and proceeded to take one another’s shirts off. Their torsos had seen better days, but they still sported impressive biceps, and for a moment it looked like they were challenging us to a wrestle. The leader even had a knife at his belt. There had been running, climbing, swimming and horse riding on our adventure, so was this to be the final event of our modern pentathlon? We smiled at them nervously for a few minutes, until it felt polite enough for us to slip away across the pass. 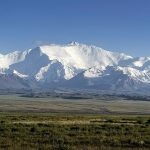 We left base camp for Osh on 7 August, and were delighted to wake up to clear skies and a lovely view of Peak Lenin across the wild onion meadows. At last we had a proper view of the mountain where we had spent nearly three weeks of our lives. 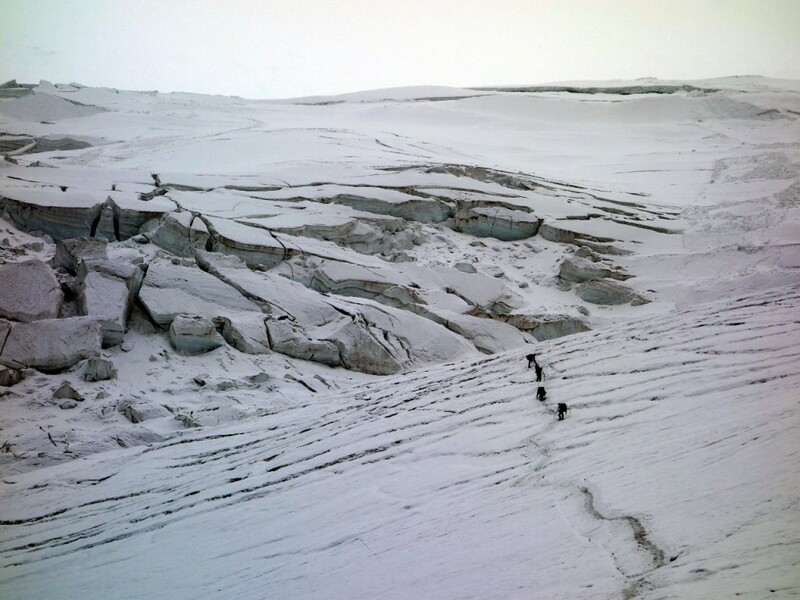 But even as we were leaving a tragedy was unfolding as a Russian guide died after falling into a crevasse below Camp 2. Storm and Sorrow in the High Pamirs is the title of a famous book about Peak Lenin. We counted ourselves lucky to have experienced only half of that. Don’t let anyone tell you Peak Lenin is easy. You can see all my photos from the climb on my Peak Lenin Flickr album. Hi Mark. I enjoy your books immensely and usually read them (again) in my tent. I have ordered you new book and look forward to reading it. it was very interesting story and I enjoyed reading it. 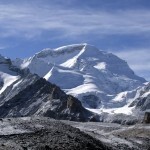 Pamir and Peak Lenin have been on my climbing list for a while. 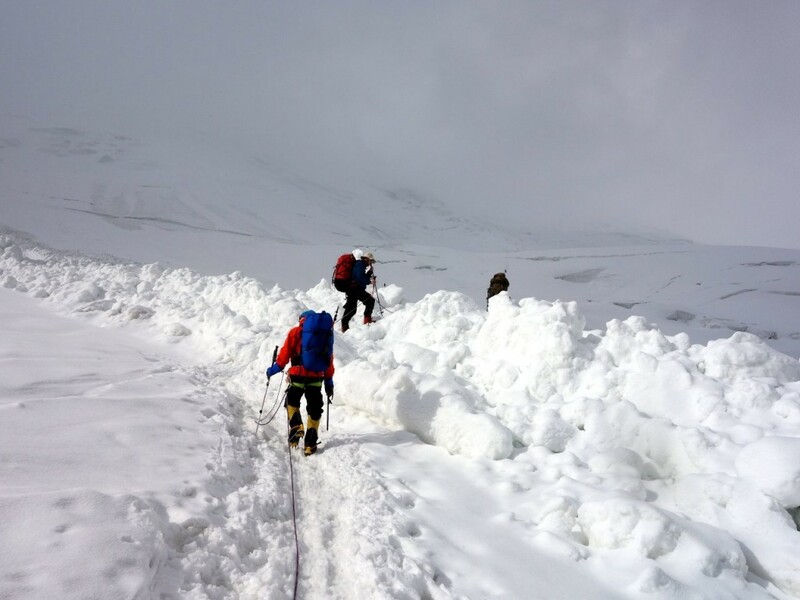 Friend of mine is right now there and today he sent me SMS from BC letting me know that they quitted the climb above Camp 3 due to bad weather and stomach problems. I climbed Aconcagua as my highest mountain and wondering how to compare these two mountains? What would be your comparison in between them? In terms of technical and physical difficulty, weather conditions, etc. All the best to your future climbs, keep up good work on your blog. Aconcagua is all on rock, while Peak Lenin is all on snow and ice. 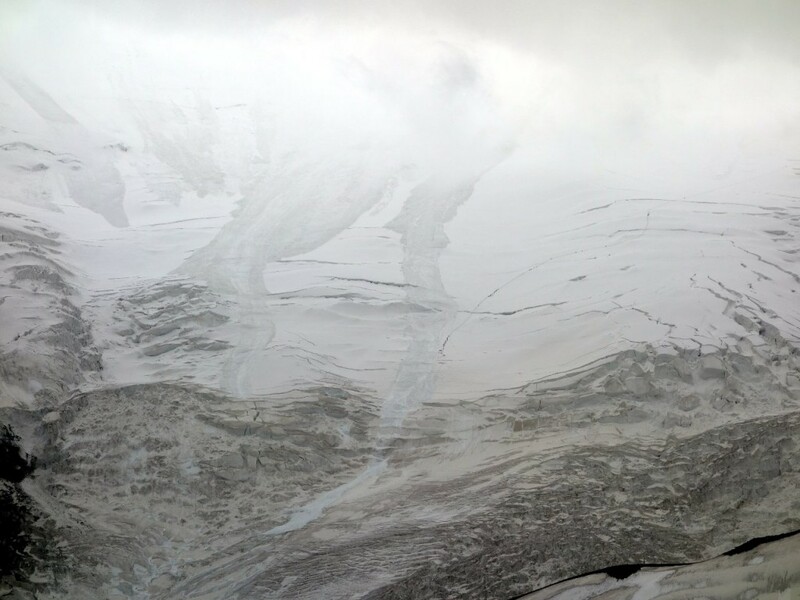 There are many crevasses and much avalanche risk up to Camp 2. Summit day is also much harder on Peak Lenin. I can’t really add anything about the weather there that I haven’t said already in this post. Am I to understand that you’re the gentleman who fashioned a pornographic snow sculpture above Camp 2 on Peak Lenin in 2015?